To add a Fill (otherwise known as a Polygon) or a line shape, the process is similar to that of markers. First, select the shape you want to make from the menu on the map. The two lines represent a Line, and the four lines represent a Fill (or Polygon). When adding a polygon, you must click the first point to “close” the polygon in order to complete it. In other words, your fourth click needs to complete the shape by clicking the first point. When adding a line, you must click the last point twice to complete the line. You can add any title you like to your shape. Titles are purely for your ease of organizing and editing your shapes. After you make a Fill (Polygone) or a Line, it will be selected in the editor underneath the map. There, you can change its color or you can delete it. Click on the “Change Color” button and the color picker will appear. 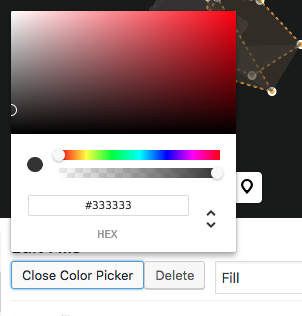 Drag and select a color and click out of the box to close the color picker. To delete a shape, simply press the “Delete” button in the edit panel under the map after you have selected the shape you want to delete.